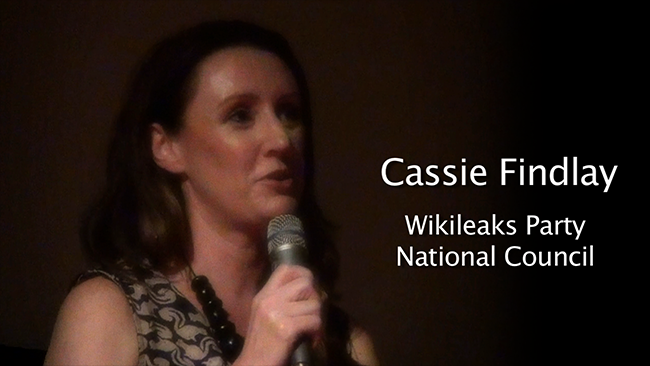 Cassie Findlay, spokeswoman for the National Council of the newly-formed Australian Wikileaks Party, delivered a moving introductory address this week to a capacity crowd at Sydney’s Chauvel Cinema. 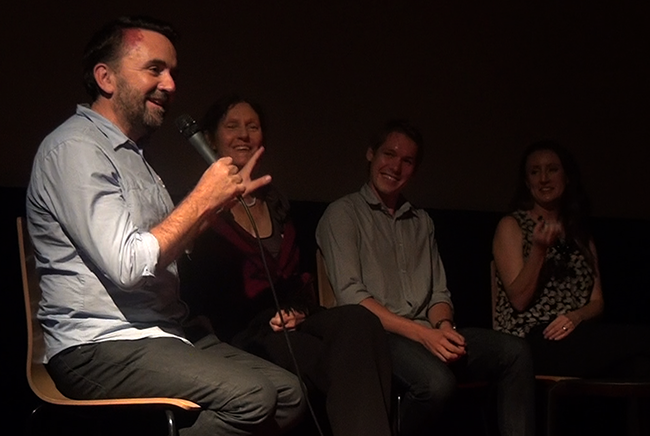 The occasion was part of a national tour of Robert Connolly’s film “Underground”, which tells the story of teenage Julian Assange, and his roller-coaster beginnings as an online activist. Christine Assange, Robert Connolly, actor Alex Williams and SBS journalist Mark Davis were onstage afterwards for a Q & A with the audience. They were later joined by Linda Pearson from the Support Assange and Wikileaks Coalition (SAWC), who called for strong action to repatriate Julian Assange, now entering his tenth month of refuge at London’s Ecuadorian Embassy. Tour organisers Kaz Cochrane and Samantha Castro, who founded the Wikileaks Australian Citizens Alliance (WACA), and who are co-members of the Party’s National Council, will also deliver personalised speeches during the film’s nationwide tour. 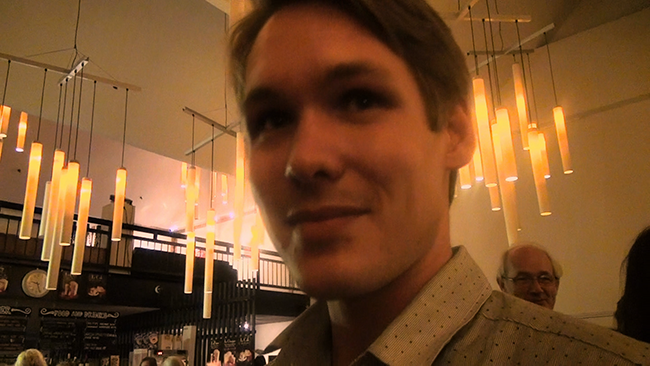 Alex Williams plays the young Julian Assange in "UNDERGROUND"
Of particular note was the solidarity expressed by the filmmakers and cast with their subject. No surprise, given the track record of award-winning director, Rob Connolly, in making politically conscious films, such as ‘Balibo’, and ‘The Bank’, where the gap between art and life has merely been widened to protect the innocent. Rob muses as I quote Alexa O’Brian’s fleeting tweet: “We don’t need any more Hollywood film scripts. We need transcripts of what’s actually happening in the court room”, and we are both reminded of Assange’s recent gripes regarding the proposed opening scenes of ‘The Fifth Estate’. A sequel to ‘Underground’ is apparently not out of the question… “Watch this space”, he says, and we really do hope he fills it. In the more immediate future, the ‘Underground’ Party Tour will continue throughout Australia. These legendary events have had a tendency so far to play to packed houses, so it’s probably best to buy tickets in advance. Go to the WACA website to (check the dates) and your closest cinema. And to everyone’s great surprise, ‘Underground’ has been selected to open the Washington DC International Film Festival – “in the cradle of American government!” in just two weeks time. This entry was posted in EDITORIAL, LIVING PROOF, NEWS and tagged 'Underground' Party Tour, Alex Williams, Cassie Findlay, Christine Assange, Eddie Cockrell, Julian Assange, Linda Pearson, Mark Davis. WACA, Rob Connolly, SAWC, Underground, Wikileaks Party. Bookmark the permalink. 3 Responses to Wikileaks and the ‘Underground’ Party Tour – don’t miss it! Unfortunately I didn’t know it was being broadcast or would have made sure I saw all of it. What I did see was very enlightening, and very well made. Is it available on DVD as yet? Looking forward to seeing the rest of the movie and joining the Party. The application form is there to download. Forgot to add: the reason why you hadn’t heard that Bradley is a UK ciezitn is because no mainstream UK media outlet has reported it. I’ve checked! This in itself is something that should be pursued rather urgently.